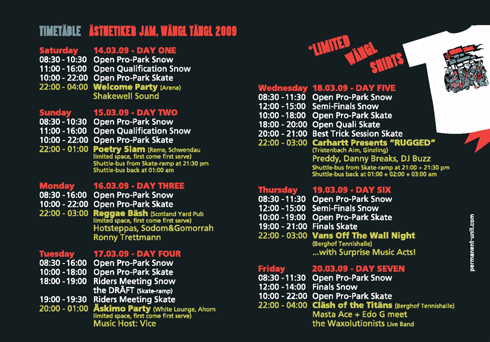 From 14th to 20th of March the European mecca of snowboarding Mayrhofen will be on fire! Back once again for the 7th year running, this unprecedented combination of boardsports, art and music, the Ästhetiker Wängl Tängl is on. 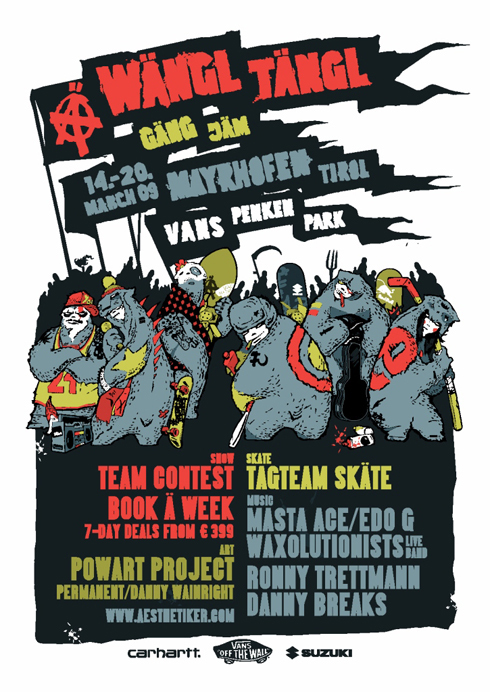 The format of this years contest in the Vans Penken Park is a “Gäng Jam“—a crew contest where teams of three riders compete against each other. The best team will take home the majority of the prize money and, as if this wasn’t enough, to the individual rider of the comp, Suzuki gives a stylish Suzuki DR125SM motorbike. For the first time ever the qualification will be open for everyone provided they enter in a team of three. Three weeks before the event, the Vans Penken Park will be modified accordingly with countless man hours and all kinds of heavy duty machinery. Once again the piece de resistance will be the Red Bull end section and as per usual will require some pretty tech bowl riding skills from all entrants! Please check out Ästhetiker’s officicial website for the complete story and all necessary information to become part of the whole show. We’ll see each other in Mayrhofen/Austria.